Damen Shipyards has received an order from an offshore support company World Wide Support to build four platform supply vessels.The vessels will be built using the Damen PSV 3300 CD design and according to Damen’s E3 principles, which include environmentally friendliness, efficiency in operation and economical viability.These principles help to reduce the environmental impact of vessels and improve efficiency at the same time.World Wide Supply chairman Knut Herman Gjøvaag said, "The new ships are highly competitive and will contribute positively to the industry, it is a modern design, but a safe operation is secured by the choice of proven technology. 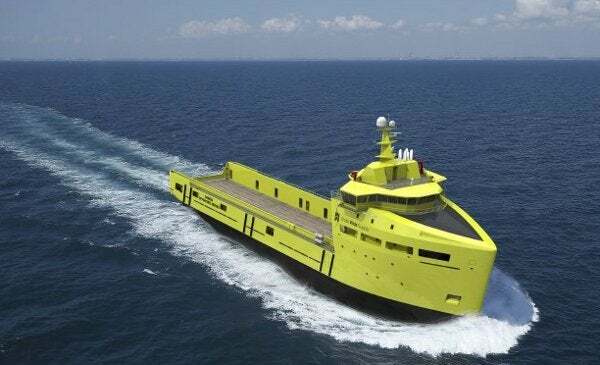 "The PSV 3300 E3 will be used to transport supplies to oil and gas rigs, and is designed to perform efficiently in adverse weather conditions.The platform supply vessels will be 80m long and offer 700m² of main deck.They are scheduled for delivery between June to December 2013, after which they will be operated by Norwegian shipping company Remøy Management.The company said that the platform supply vessels will have an improved speed performance compared with earlier vessels, and will incorporate proven technology and components from its other platform supply vessel series.World Wide Support is expected to enter into a management agreement with Remøy Management to draw its experience and services with respect to vessel management and crewing. "We are also satisfied with the fact that Remøy Management has invested into World Wide Supply and accepted commercial- and technical management of the ships," Gjøvaag said. "The company’s background from the offshore industry and safe operation of coastguard vessels for the Norwegian Government secures a highly professional operation of the vessels when they enter the market in 2013," he added.Damen had previously planned to launch a new range of platform supply vessels in the first quarter of 2012, which will range from 1,500dwt to 6,500dwt in size.Image caption: The platform supply vessels are designed to perform efficiently in adverse weather conditions.